After last week’s comic strip full of Star Wars movie quotes, we thought we’d keep everybody in the spirit and post today’s strip full of Top Gun quotes. It is not our first strip of that kind, of course. All those movie quotes are some of the most challenging things for me to translate, when I turn our comics into German. Because my memory isn’t good enough to know all the movies completely by heart, and that in two languages, I need to find both versions, or scripts or short clips on Youtube to find out how a certain phrase was translated into German. That’s a really interesting experience, because it is amazing how much the original and the dubbed version sometimes differ. It can be a really grueling task. Sky Fighters looks like a knock-off of Stealth. Interesting. Stef, I like the cameo of Launchpad. And that German site of yous… where do we find it ? There is no German site, unfortunately. 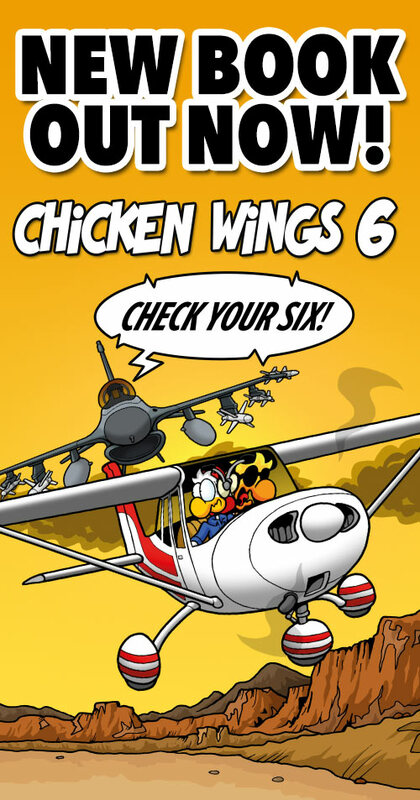 But our strips are published in German regularly in Fliegermagazin, and a spin-off in Flugzeug Classic. Currently I’m working on a translated version of one of our books, but it will be a while until that hits the market.